Last November San Diego State University’s president, Adela de la Torre, gave an eye-opening talk before leaders of the San Diego Community College District and the San Diego Unified School District. After first promising to work on getting students to graduate on time and to minimize their debt, de la Torre then asserted the importance of diversity, as she should. 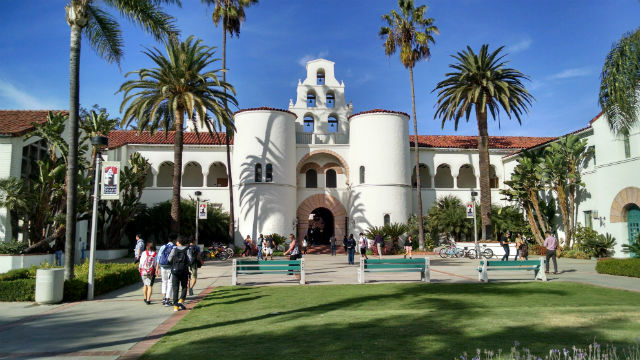 SDSU hosts a wide variety of students: Latinx make up 29.3% of the campus; Asians 7.4%; those of “multiple ethnicities,” 6.7%. All told, “students of color” make up 54.7% of the student body, “white” makes up a little more than a third. So it would seem that SDSU is more than succeeding when it comes to achieving a diverse student body. This goes way over the line. To begin, assuming that student success depends on professors resembling their students should be a non-starter. Does de la Torre really mean that Chinese students cannot be taught by African-American professors? That a white student will not be successful if taught by a Latinx professor? That a woman with long hair cannot teach a man with short hair, or vice versa? Is de la Torre really saying that if a professor does not look like a particular student, that person will not succeed in school and life? I’m hoping not. Except that’s exactly what she said. Equally importantly, de la Torre focuses on creating “STEM leaders.” Not “leaders,” no adjective, which would open up the category to any of the university’s seven colleges. Instead, she privileges “STEM” at everyone else’s expense. This isn’t the first time de la Torre has said that science, technology, engineering and math rule. In her 1993 Los Angeles Times op-ed about how the UC system should respond to budget cutbacks (included in her 2002 book, Moving from the Margins: A Chicana Voice on Public Policy), de la Torre wrote: “Cutting expensive programs such as mechanical engineering and allowing the proliferation of large general education courses may gain an institution short-run dollars but won’t truly serve the public interest.” In other words, mechanical engineering serves the public interest, general education courses, not so much. De la Torre’s privileging of STEM over the humanities is misguided for any number of reasons. First, SDSU’s president seems to assume that only a STEM career will give students a decent life. But that’s just not true. STEM leaders also need the humanities. Do we really want to train computer scientists without an awareness of the dangers involved in creating “deepfake” programs that can take a video of anybody and make it seem as though they are saying anything. Or as Scarlett Johansson discovered to her horror, grafting her face onto pornographic videos. Do we really want biologists without some grounding in the ethical issues involved in editing human genes? Shouldn’t scientists, mathematicians, and engineers understand the legal, historical and moral complexity of immigration? Doesn’t that serve the public interest? And shouldn’t SDSU try to educate leaders in all fields, not just STEM? After all, Alexandria Ocasio-Cortez, newly elected congressperson and mistress of Twitter, graduated from Boston University with a Bachelor of Arts in International Relations and Economics. Isn’t Rep. Ocasio-Cortez exactly the kind of leader we hope to create? These are not idle questions. Recently, Chancellor Timothy White issued two executive orders designed to speed up graduation. A laudable goal, but these orders threaten to decimate SDSU’s College of Arts and Letters by cutting down the number of general education classes student need to take. Not only can students double count courses in their major for their general education requirement, but under the new regime, a student can graduate without taking a class in either history, literature, or philosophy, courses that are absolutely necessary for understanding crucial issues (see above). This is also not a smart financial decision, as humanities courses generate significantly more teaching revenue than STEM courses. The tuition is the same, but STEM professors need labs and the latest, most advanced equipment. Humanities courses require a lot less overhead, and the revenue a large general education class generates subsidizes the mechanical electrical engineering class. While de la Torre has been very vocal about issues that matter to her, she has not said anything publicly about these orders and the devastating effect they will have on the College of Arts and Letters. That needs to change, as the humanities are central to both SDSU’s mission and fiscal health.